Sometimes, any one pair of gardening gloves may not be suitable for all tasks outdoors. With the Briers Men's Gardening Gloves (Pack of 3 Pairs) B1113, you can effectively kit out your garden attire with all of the elements required for facing garden work head-on, no matter what the weather or how tough the task. The triple-pack of gloves provide heavy-duty protection and comfort to ensure you can be prepared to face the garden in virtually any circumstance. The product code for the gloves is: B1113. The Black Rigger Gloves are constructed from tough and durable leather for heavy-duty protection. They are breathable with an elasticated back for comfort, and feature an extended loose safety cuff for additional forearm protection. The gloves are ideal for intense gardening tasks such as demolition, tree felling, and cutting brambles and logs. With quality leather coverage on the thumbs, forefingers, fingertips, and in between the fingers, you can handle garden tools and equipment with confidence. Thick and fully waterproof, the PVC-coated gloves are ideal for working with rainy or wet weather conditions. The green-and-white colour scheme makes these gloves quick and easy to identify, allowing you to get on with the job as quickly as required. With an elasticated cuff, the gloves fit comfortably without causing restriction to movement. They also prevent dirt and debris from entering the gloves, providing all-round quality protection. Designed to provide hands with ongoing comfort while working in the garden, the Cotton Drill Gloves are constructed from soft cotton. They fit snugly with a stretchy back for a better fit, allowing you to maintain good dexterity. The Cotton Drill Gloves feature an elasticated cuff to keep out dirt and debris. They will allow you to spend long hours in the garden while ensuring your hands remain comfortable and protected. 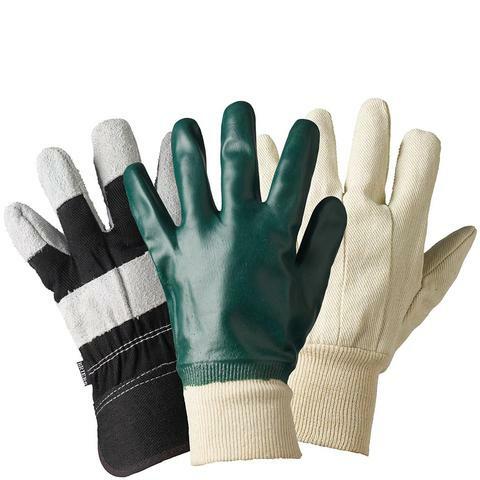 The Briers Men's Gardening Gloves B1113 are available in a single size that should be suitable for most users. Please consult the table below for details.